One of our favorites is Blueberry Banana bread. Whether mid-summer with fresh picked berries (like today) or thawed berries from the freezer, it is delicious. Today we tried a new variation substituting apple sauce instead of the shortening. The result was even more flavorful AND the blueberries were evenly distributed, rather than weighted towards the bottom. Contrary to popular belief, coating them with flour does not make much of a difference. Mix ingredients until blended. Fold in the blueberries and the last 1/4 cup of flour at the end (if you mix them early they get smashed and the color is just plain wrong). Pour the batter into the 2 loaf pans. Sprinkle the tops with 1 T Turbinado sugar per loaf. Bake for 40-45 minutes. Check after 40 but make sure the center is getting done. Don’t be afraid to extend the cooking time by another 5-10 min. Cool for 10 min in the pan, run a knife around the edges to loosen, and then turn out onto a rack to cool. Teal can do this neatly ending up with the loaves upright and intact, me not so much. Compared to the original recipe with shortening, the edges are not as crunchy initially, but after a day or so it does not matter anyway as this is a very moist and dense bread. These will keep for a week or better in the fridge and freeze well. 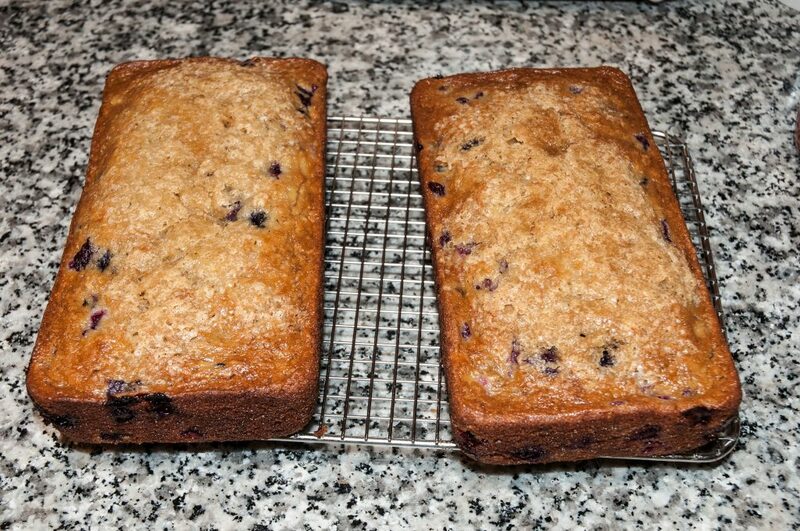 Blueberries work well in many batter/ quick breads. We use them in zucchini, lemon poppy seed, rhubarb & apple breads. With fresh berries mix them in and extend the cooking time by about 10%. Try the applesauce vs. fat in other recipes as well. Typically a 1 for 1 substitution by volume for quick breads and cakes works well. We have become turned to chicken legs and thighs as our meat of choice lately. We have become dissatisfied with chicken breasts and Teal thinks the thigh meat also makes better chicken salad for her sandwiches. The more flavorful and juicy meat responds well to low and slow cooking. I was then looking for a new way to brine and then smoke them. We also had a surplus of Coke left over from a party that I needed to get rid of and neither of us drinks regular soda. So I started searching for “coke smoked chicken” and this yielded a variety of results that were all promising but quite varied in both formula and time to brine. We also had a family get together coming up so I needed a big pile of chicken. The resulting recipe was VERY well received (no left overs). 4- 5 quarter family packs of chicken legs and thighs. Cut the legs and thighs apart before brining. Place the cooler in the fridge or put the small cooler in a big cooler filled with ice. Turn or shake vigorously at least twice per day. Prep the smoker. I use a Big Green Egg (Large) with a Heatermeter for temperature control. The Heatermeter is a DIY open source temperature controller that makes long smokes easy (but this was a short one) . Start with the bottom filled with lump charcoal at one edge and two 2-3″ diameter green cherry or apple branches the width of the firebox. Get the BGE up to about 200 degrees F and then add the chicken. I used the indirect method with the ConvEggtor and the 3 layer grate to hold this much meat. The heatermeter was set for 225 degrees F. The smoke was for 3.5 hours. Raise the temp to 325 for 30-45 minutes at the end to crisp up the skin a bit. Remember when smoking, you don’t want to let the fire get too hot initially and then struggle to get it down to the right temp without putting it out (again). 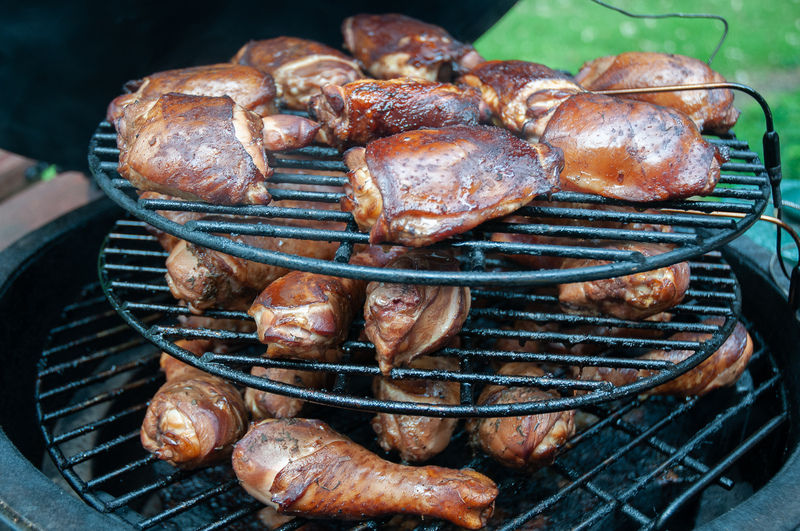 The chicken should be removed form the brine, dried with paper towels and placed on racks 1-3 hours before smoking. If you don’t the chicken will be sooty rather than golden brown. In the end, you have chicken that is luscious, juicy, deep mahogany brown and with a nice but not overpowering smoke flavor and a pretty pink smoke ring. It is good hot or cold. We did sample a couple of legs at the 24 hour mark to make sure the brine flavors were going in the direction we wanted. If you live nearby, I have plenty of surplus cherry and apple wood for smoking. The plans called for using a lot of salvaged components from other bikes. I don’t have any frames to cut apart and wanted to use modern components for the most part. The first pieces built up were the wheels. 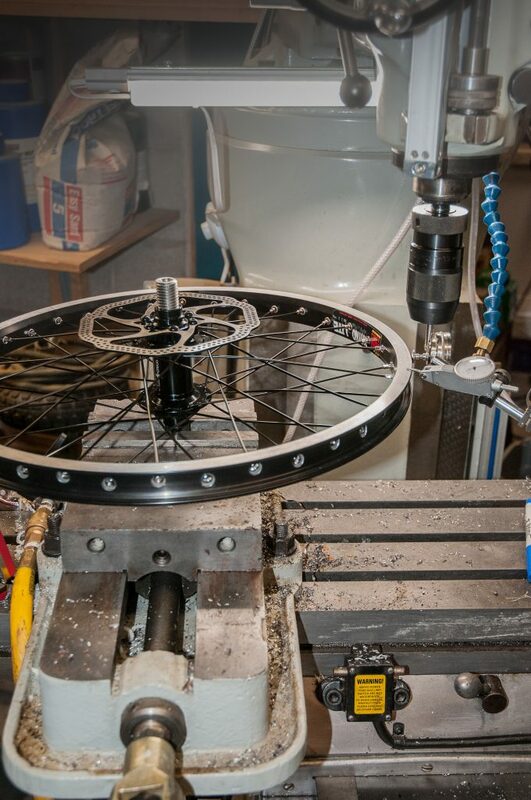 This was my first experience building bike wheels. 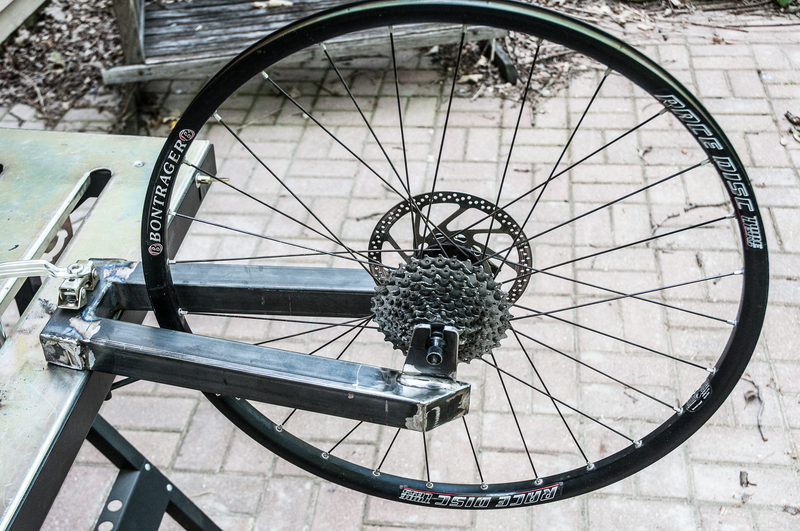 These are built from BMX components and I even found 100psi capable tires for the nominal 20″ (604mm) rims. Until starting this, I did not know there are 6 different nominal 20″ sizing systems which are incompatible! I needed 3 headstock bearings, one for each front wheel and one for the the underseat handlebars. For these I am using FSA “The Pig” . The bearings must be pressed into the headstock tube. Normally the tube is reamed with special reamer which I don’t have. Instead, I faced and then bored the shells on the lathe. These are 2.5″ long for the wheels. The bearing seats will then be press fit in place. The arms that go from the spine of the frame to the front wheels need to be coped to fit these shells. Rather than cutting each to length and then coping the end I cut the pieces to double length and then used a 1.5″ hole saw in the middle. The tube is 1.5″ square so the hole saw nearly cuts through the sides. This makes a nice clean arc faster and more accurately than trying to saw and grind per the plans. 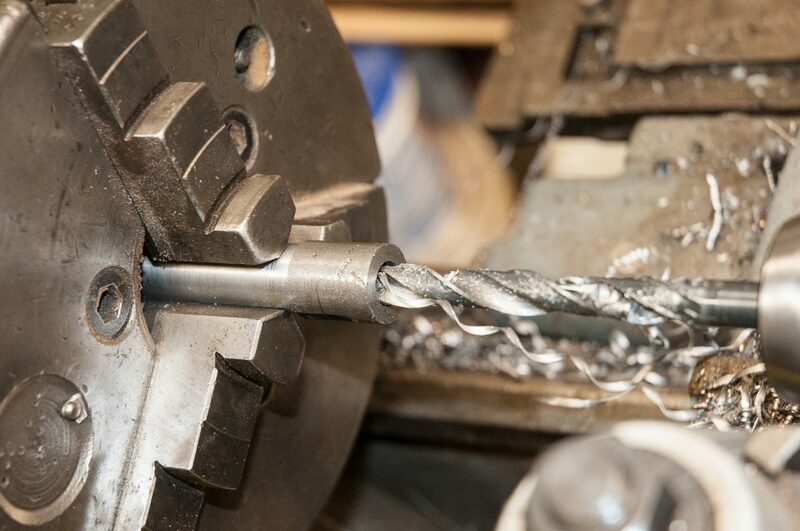 You do need to clamp securely and do this in the drill press or mill. Use the lowest speed available and lots of lubricant. The Bridgeport works nicely for this and I was using mist cooling as well to avoid damaging the hole saw . You can see the nice fit-up of the coped arm ends against the bearing tubes. The front axle shafts and steerer tube are also coped and shown at the approx 15 degree angle that is required. Steerer tube is 1-1/8″. Crank bottom bracket is adjustable. 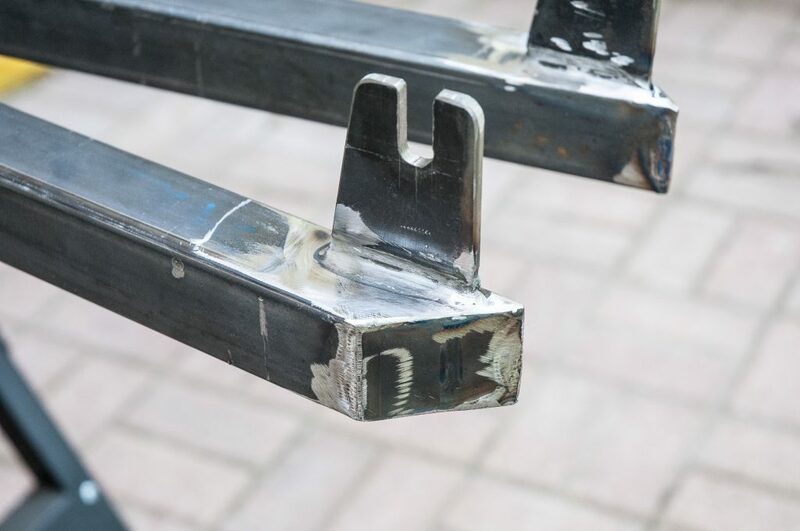 The clamp bars were made the same way out of 3/16″ x1.5″ steel flat stock. 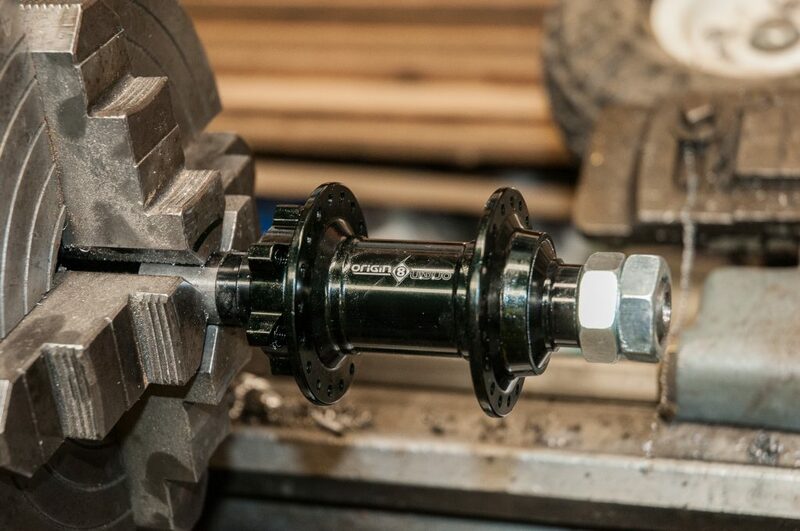 The shell is a standard 74mm ISO threaded bottom shell from Framebuilder supply. Here you can see the bottom bracket shell fit up and ready for welding. Note there is a shim on one side to allow for the paint thickness later. 3/8″ bolts secure it to the spine tube. .Parts list for the front wheels. These were purchased from Niagara Cycle. 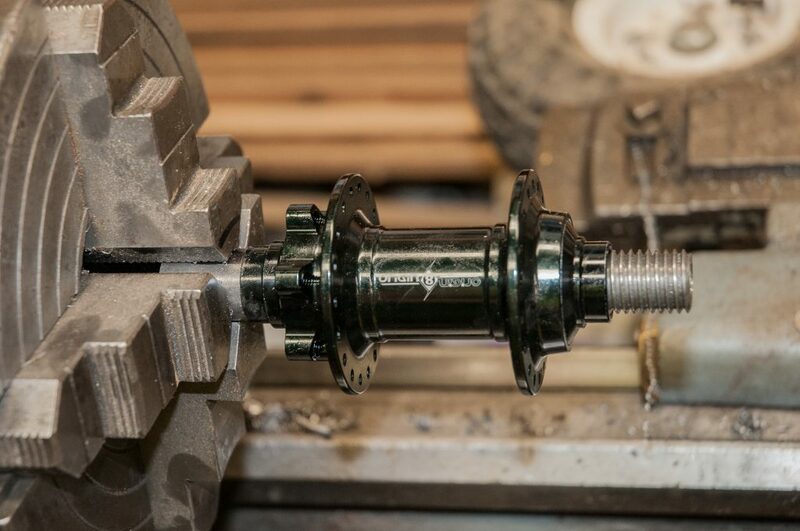 The front axles of the trike are some of the highest stress load components. I am using 20 mm BMX hubs but now need axles to match. 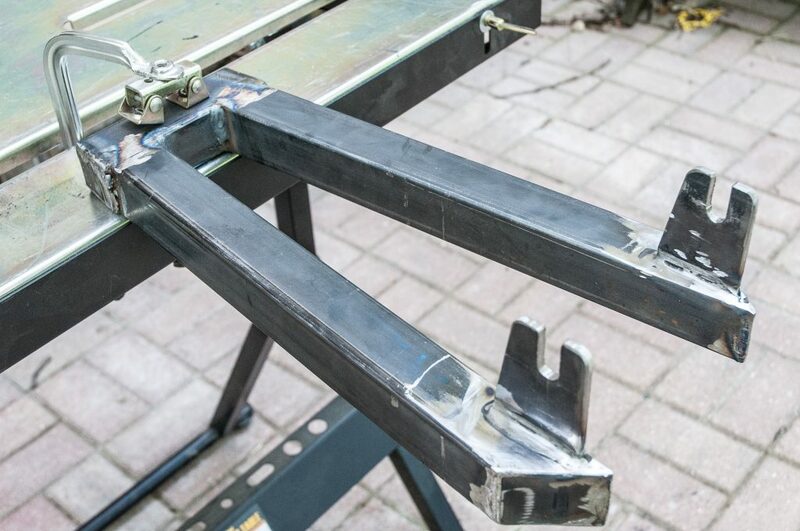 The AZ (Atomic Zombie) plans call for taking bolts, welding on some material and then grinding to “fit”. I wanted to to do better. The axles start out as 7/8″ cold rolled steel. Then there is some metal lathe work to get them to finished proportions. Raw stock should be 158 mm long. 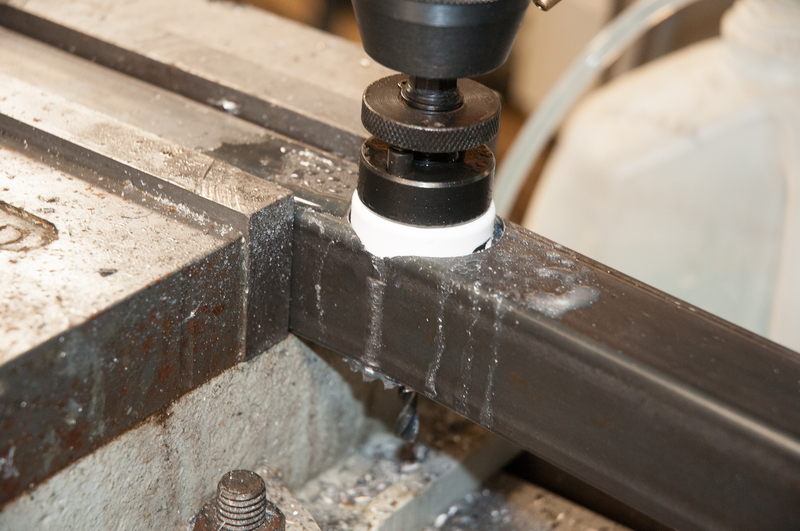 Face off the ends to 155 mm and center drill each end. Mount in 4 jaw chuck and center it up. Note that a 5C collet would not hold the stub end tight enough, and my dog and faceplates would not work for this size stock, so I had back to the chuck. Tail end center is a ~1/2 face solid center to allow for the tool clearance. Step down to 20mm for 133mm from the tail end. Test fit the hub. It should be a tight sliding fit. File if necessary. Step down to .73″ diameter for 27mm from the tail end to prepare for threading (sorry for the mixed units) . Make a small 3mm wide by 2mm deep groove next to the step to allow the threading tool to run out into it. Thread the end to 10 TPI and test fit against the nuts. I am using a double jam nut setup. 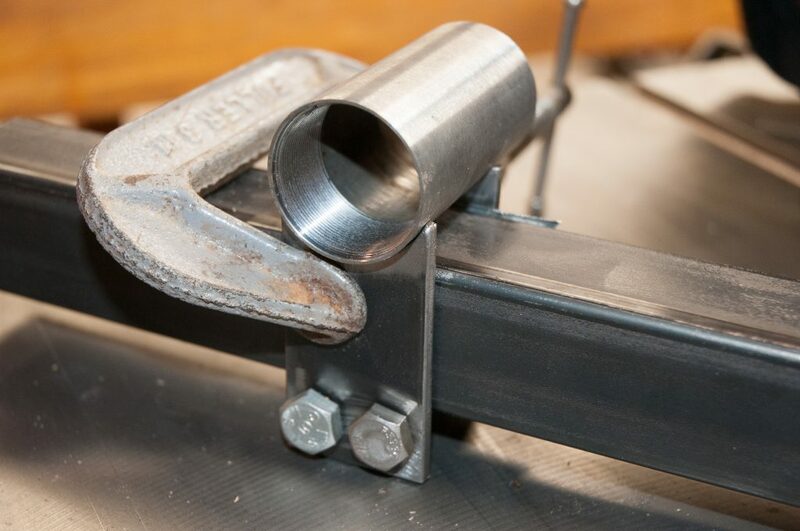 Drill through at 3/8 ” from both ends and for the length of a 1/2″ drill from the post end. For me, life is not complete without projects. I need to build things or at least rebuild them. Merely using things, does not satisfy me for long. I have to “make it better”. So this has lead to the current project, which is a tadpole style recumbent trike (human powered – the VTX is not being harmed in the process). The trike is base on the Atomic Zombie Warrior: http://www.atomiczombie.com/Warrior%20Recumbent%20Tadpole%20Racing%20Trike.aspx > It will of course have multiple modifications along the way to improve the design and make use of the machine tools I have rather than getting by with hand tools. Plus I am keen to add fixturing for stability and accuracy rather than hand holding or using props like buckets. This is largely a welding project. So the patio we added last year outside of my shop is getting some use. Many of the parts were purchased from someone who was parting out a cracked Trek carbon fiber mountain bike. 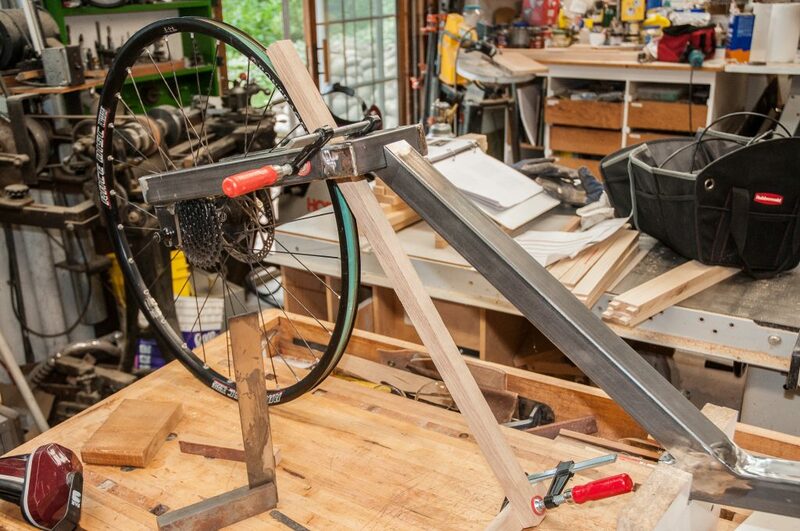 You start by building the rear fork and “spine” of the trike. 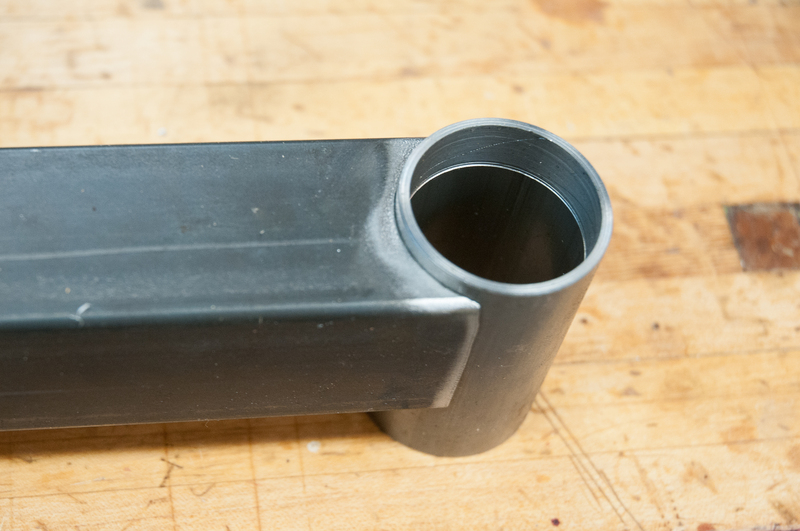 The tubing is 1.5″ across with 1/16″ wall thickness. The plans state the heights of the pieces, but omit the angles. 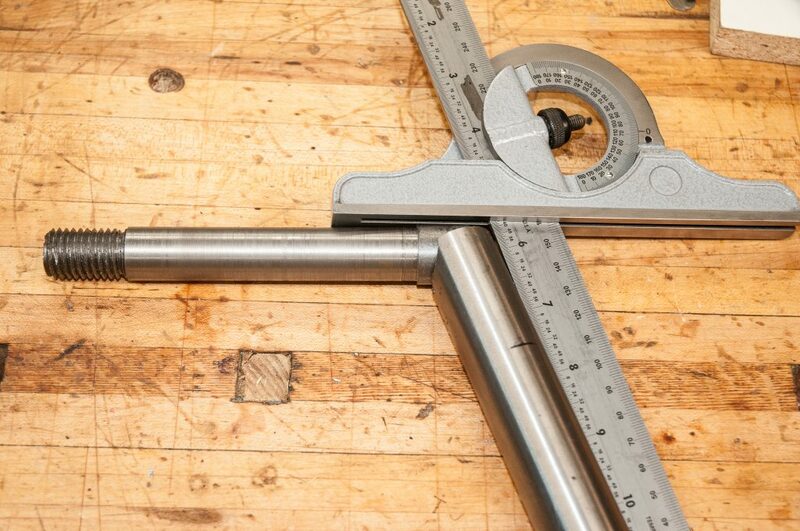 The angles are cut and filed “to fit”. The rear fork is the first assembly. The tubes are cut and then welded up. 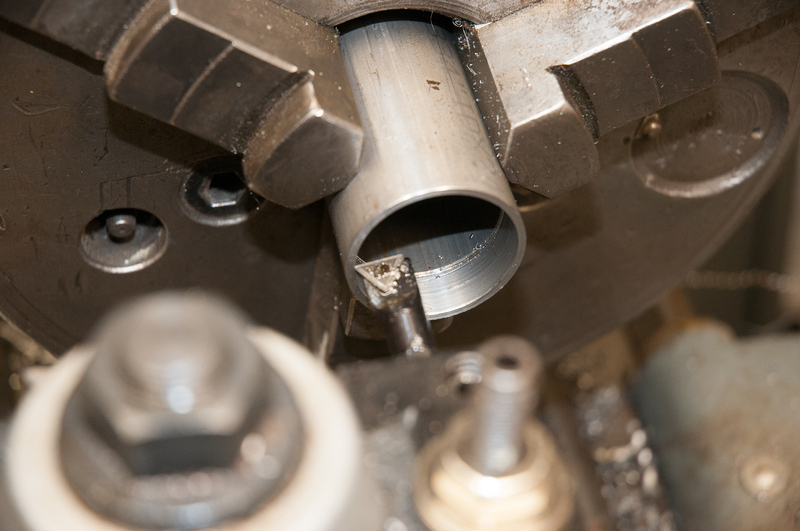 Tube ends are capped off with welded on pieces. The drop outs are added next. Her is a close up of the rear drop outs. You can still see the scribe marks for where I drilled and milled the slots. 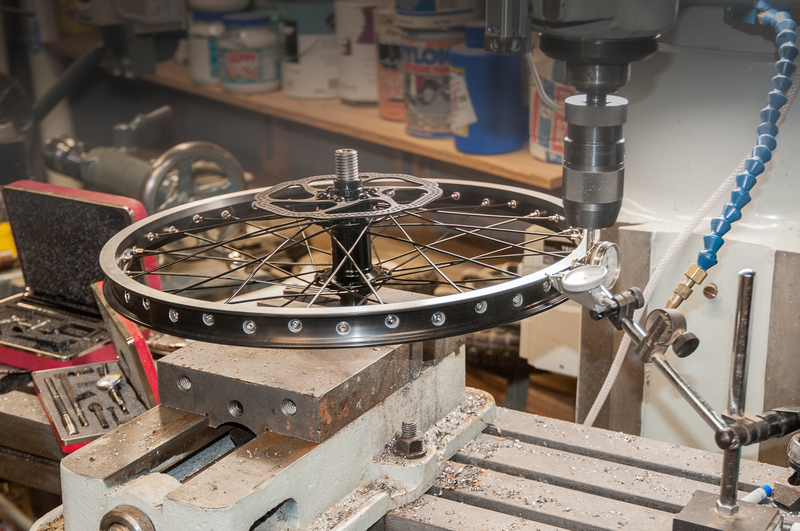 This is the first test with the donor cycle wheel. It is nicely centered. Here I am starting to weld up the spine of the trike. The blocks are ordinary melamine coated 1/2 ” MDF scraps that have been squared and notched for the tubing at the correct heights. 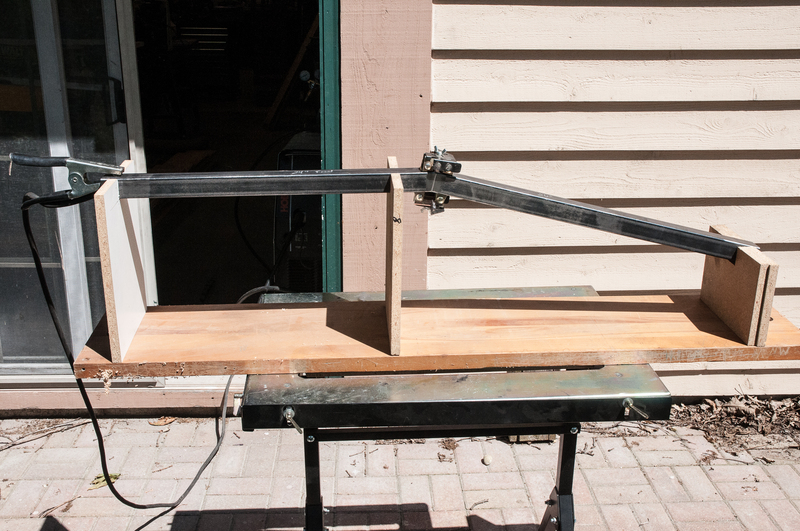 The reference for this setup is the front edge of the board resting on the welding table. Now with the spine welded up, it is time to fit the rear fork. So this means another trip back into the shop. 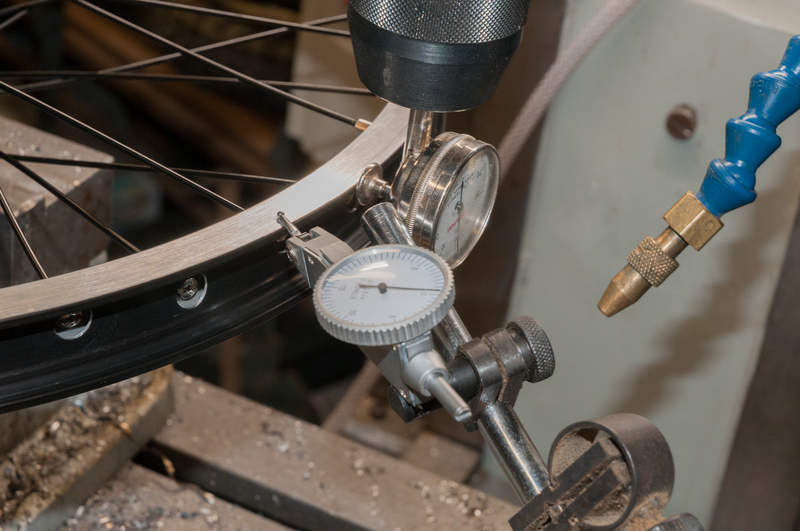 The front wheels are made from 20″ BMX components with a 20mm center shaft hub to handle the force of only being supported at one end. This is the first time I have laced a bike wheel. 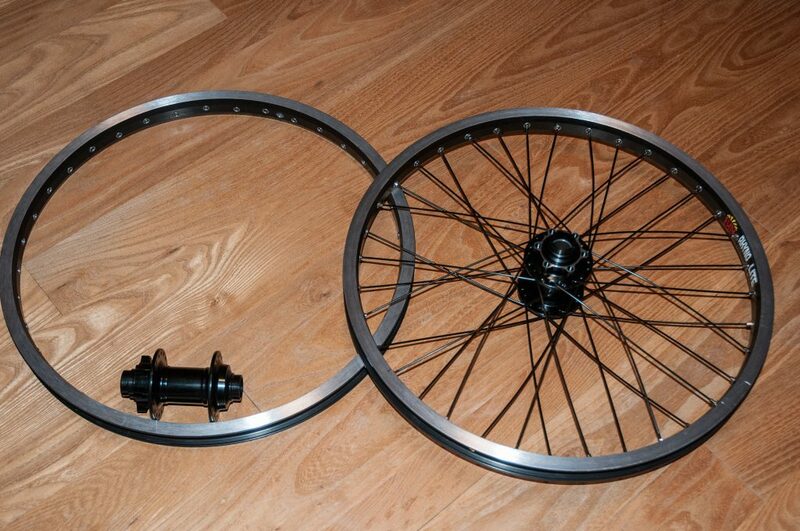 One wheel is assembled and ready for truing and the other is still awaiting assembly. However, the hub must be used for fitting the axles which will be turned on the lathe.